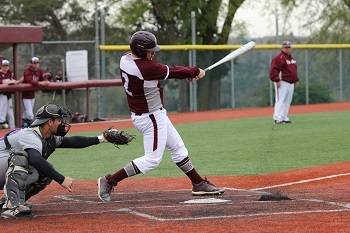 College of the Ozarks’ baseball hosted the second day of a two-day Tri-Match on Saturday, which included the Bellevue University Bruins (Neb.) and the Columbia College Cougars (Mo.). 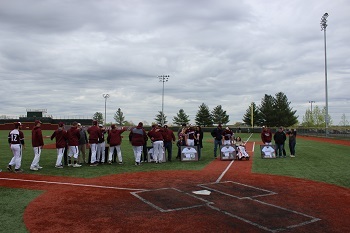 C of O also celebrated Senior Day, honoring five Bobcat players: Ethan Whiteis, Kole Kelley, Isaac Norsic, Jay Kaufman, and Collan Thrasher. After winning a pair of games on Friday, Bellevue University looked to complete the weekend sweep on Saturday. The sweep would prove to be a difficult task for the Bruins as they would need a come-from-behind victory in the first game to knock-off Columbia College and quickly found themselves in a pitchers’ duel in game two against the Bobcats. After hitting the first Bruin he faced, Bobcat starting pitcher Bryce Burtless worked his way out of trouble unharmed. In the bottom of the first inning, C of O struck first on a Kyle Abrahamson (2-3, run) double that painted the left-field line. Abrahamson would subsequently score on a Kole Kelley (1-4, RBI) single. In the top of the second, Burtless would again walk the lead-off hitter. This time the Bruins would capitalize to knot the game at 1-1 after a double down the right-field line. Starting with the bottom of the second, both pitchers settled-in to stifle the offenses. The Bobcats used some nifty defense including a 4-6-3 double play in the third and a pick-off at first base in the top of the seventh to help send the game to extra innings. In the top of the eighth, Max Pulley (0-4, BB) fouled-off multiple pitches to grind out a walk. Following an intentional walk to Jay Kaufman (0-2, BB), Kole Kelley reached on an error to load the bases. Unfortunately, it was a missed opportunity as the Bobcats were unable to score. In the top of the ninth the Bruins would use a two-out rally to take a 3-1 lead, which was all they would need to complete the victory. In the final game of the day, the Bobcats would take on Columbia College. 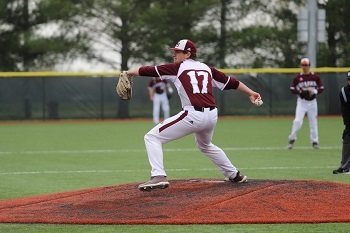 The Cougars would start Grant Starke on the mound while the Bobcats countered with Senior Jay Kaufman. Kaufman quickly took control of the game with a 1-2-3 first inning. Starke struggled to find the plate and was replaced in the second inning by the Cougars, the first of three Columbia College pitching changes for the game. In the top of the fifth, Columbia College used a sacrifice bunt to move a lead-off single into scoring position. This proved useful as the Cougars would take a 1-0 lead on an infield hit. The Bobcats wasted no time striking back in the bottom of the frame. Brent Shinkle (1-3, run) started the rally with a single to left field. Max Pulley (1-3, double, 2 runs, RBI) roped a double to left-center for an RBI. An errant pitch would give the Bobcats a 2-1 lead. The seventh inning provided plenty of drama as Kaufman found himself in trouble after a pair of walks. A Columbia College double sent the Bobcats into the bottom of the inning down 3-2. Then, Max Pulley would start another rally by battling to draw a walk. A Kyle Abrahamson (0-3, sacrifice) sacrifice bunt would move Pulley into scoring position which brought Jay Kaufman (2-2, HR, run, 2 RBI, 2 BB) to the plate. 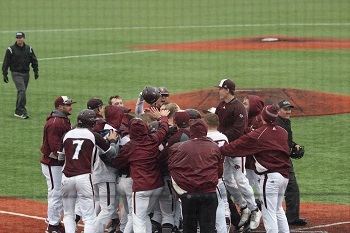 Next, Kaufman would drill a 1-0 fastball for a homerun between the scoreboard and foul pole in left field for a Bobcat walk-off victory. Jay Kaufman was also credited with the complete game victory on the mound. The Bobcats are now 20-23 on the season and resume action Tuesday, April 16 when they host Williams Baptist University.